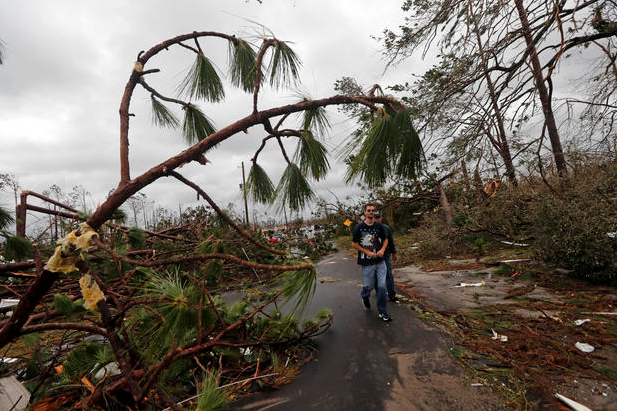 Hurricane Michael has killed at least one person as it continues to move inland over the Southeast. The storm made landfall on the Florida Panhandle Wednesday afternoon as one of the most powerful storms to ever hit the U.S. The terrifying Category 4 hurricane was packing maximum sustained winds of 155 mph when it crashed ashore near Mexico Beach, a lightly populated tourist town about midway along the Panhandle. The National Hurricane Center (NHC) described Michael as “potentially catastrophic.” Debris was strewn across miles of Florida’s coastline: Roofs and awnings peeled back from buildings, pieces of homes scattered amid snapped trees and downed power lines, chunks of beaches washed away. The Gadsden County Sheriff’s Office in Florida said Wednesday evening one person was killed by a falling tree during the storm. As of 8 p.m., Michael was about 20 miles southwest of Albany, Georgia, with maximum sustained winds of 100 mph, according to the NHC. Forecasters said Michael has become a Category 1 storm as it moves across land. Nearly 30 million people in the Southeast were in its crosshairs. Strong winds and rains will thrash Georgia and North and South Carolina, including areas that got a drenching last month from Hurricane Florence.